“The Cares of a Family Man” is a short story written between 1914 and 1917 by Franz Kafka about a creature called Odradek. According to The Font of All Human Knowledge, “The creature has drawn the attention of many philosophers and literary critics, who have all attempted to interpret its meaning”. At first glance the creature appears to be “only a broken-down remnant”, “old, broken-off bits of thread, knotted and tangled together” but with odd wooden crossbars that allow it to “stand upright as if on two legs”. Yet although “the whole thing looks senseless enough”, it is “in its own way perfectly finished”. When it laughs, “it is only the kind of laughter that has no lungs behind it”, with a sound “rather like the rustling of fallen leaves”. To the narrator, “the idea that he is likely to survive me I find almost painful”. 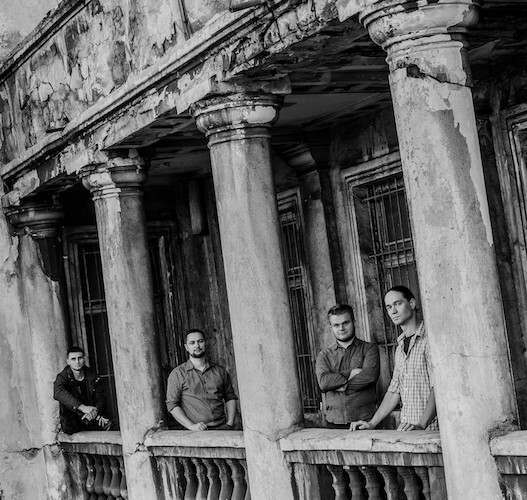 It is from that perplexing story, and that word Odradek of uncertain origin, that the Ukrainian band Odradek Room chose their own name, a vehicle for creating progressive metal with a foundation of doom. Hypnotic Dirge released their debut album Bardo. 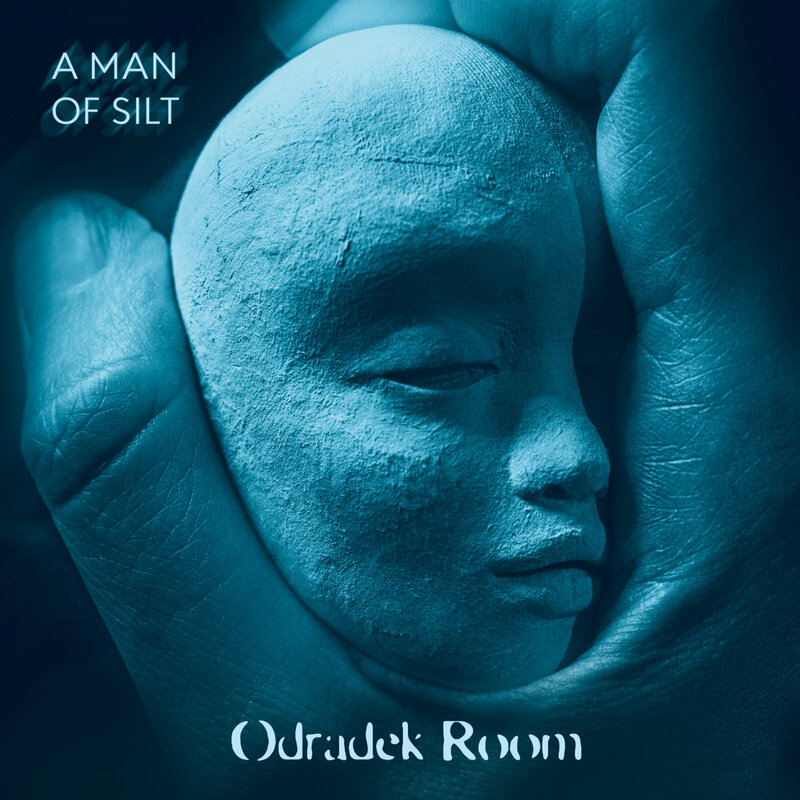 Relative Reality in 2013, and on October 10 they will release the band’s second album, A Man of Silt, in conjunction with BadMoodMan Music (a side label of Solitude Productions). What we have for you today is the premiere of a song from the new album named “Mirror Labyrinth“. “This is a story about an abstract travel of a human from nothingness to nonexistence, during which he tries to see and understand himself. He sees his personality melting and rising, splitting and merging. He sees that his personality is nothing more than a combination of figures like on a chess board in Herman Hesse’s magic theatre. His personality is conditioned as everything else is in the world of forms. The human sinks in his own scaring, sick illusions and consciousness projections, and sees clear light and clear nature of reality. The song we’re bringing you today is as mysterious and haunting as the Kafka story that provided the inspiration for the band’s name. Its intensity ebbs and flows. Slow and somber at first, with a spectral guitar melody as the centerpiece of the intro, it becomes more urgent, in part through an accelerating rhythmic drive and the appearance of tormented harsh vocals. Jagged, jabbing riffs push the intensity further as the melody soars and glides. And just as the guitar work begins to swarm and rip… the intensity diminishes, the song becoming heavier and more harrowing. And here, a soulful but sorrowing dual-guitar melody emerges, and impressive clean vocals tease out the melancholy melodic threads of the song even further, the experience then capped by a bluesy extended solo over a heavy, head-nodding bass line. It’s an entrancing song, introspective and thought-provoking. Look for the album on October 10. It is recommended for fans of late-period Katatonia, mid-period Opeth, Ihsahn, and Devin Townsend. P.S. To read an English translation of Kafka’s strange short story, quoted in the intro to this post, go here. I read the original German story in a class a little over a year ago – it’s a fascinating, impossible-to-crack little nugget that provokes a lot of thoughts, questions, and discussions, but almost no answers. It also takes about 2 minutes to read at most – I’d highly recommend following the link to the English translation of it above. A couple of interesting notes on it as well: The title in German – “Die Sorge eines Hausvaters” – invokes, for me, a sort of odd reflection of or counterpart to the concept of the housewife – what Kafka is doing by using such a term is still anyone’s guess, of course. Further, the description of Odradek’s breathing brings to mind common turn of the century literary descriptions of tuberculosis, a disease which widely captured especially the literary mind at the time. Angst regarding TB provides, in my view, another interesting element to inject into the reflections on life, sickness, and death that the story provides. Thanks for all the additional info. I had never heard of the story before learning more about this band and how they came up with their name. It’s fascinating how such a very short story has spawned such a large number of interpretations and speculations. Kafka does that notoriously. None of his works are terribly long, but he leaves a lot unsaid (and likely unanswerable, though those interpretations and speculations show that we’ve certainly tried). Amazing music! Waiting for the album.